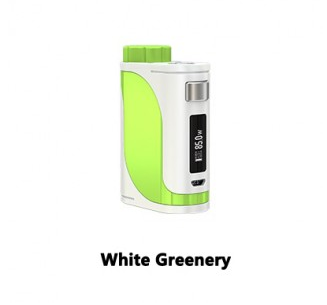 iStick Pico 25 released by Eleaf really meets the demand of the market. Now let's find out the reasons. Pico25 applies previous package. It is a full kit including a user's manual,a cable, a ELLO atomizer and back-up apron and atomized core. From the picture printed in the middle of the package, we can know that the Pico25 has a size of 25mm and supports 2A current for quick charge. The size and appearance of Pico 25 don't differ greatly from iStick Pico Greece apart from the increased single-colored decoration on the host. The host measures 70.7mm wide, 48mm wide, 24.9mm thick, weighing 99g without battery. 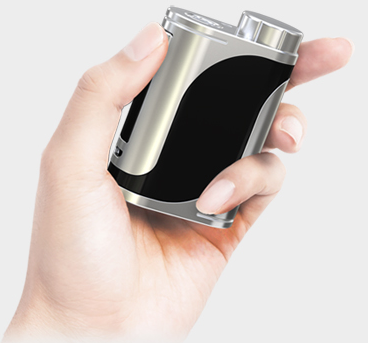 Although Pico25 is wider and thicker than the first generation of Pico, it is still easy to hold in hand. With increased thickness, Pico25 can support 25mm atomizer at large comparing with the first generation of Pico which can only support 22mm atomizer. Pico25 follows its conventional layout,with its display screen and fire button on the side.However,the size of both has improved and the letter also has enlarged so that you can see it more clearly ="+" "-" adjustment key is still in the bottom. Normally it will not touch the button when put on the plane. If placed on the bumps,it will likely touch the switch. The official website has a total of 6 colors for your option. Removing four T5 screws on the top and bottom, you can disassembly it. From the exploded view you can see that the body decoration of Pico25 and the inside design are integrated.The main body of the plastic contains the battery position,two zinc alloys up and down. The lower zinc alloy is the positive part of the battery. So usually do not put the host on the wet / liquid places. Two pieces of circuit board are pulled together. The main control chip is at the bottom of the screen.It is easy to disassembly Pico 25.Learning how to disassembly can make it easier for you to clean when oil spill into the host. In the initial installation of the battery, it will automatically start. Usually switch the ignition button to turn off/on it. As the design of Pico, its adjustment keys are at the bottom. In order to prevent some incidents, I recommend you to lock adjustment by long press "+" "-". You can switch modes by pressing the ignition button.